Allow us the privilege of turning your back yard into an outdoor home. 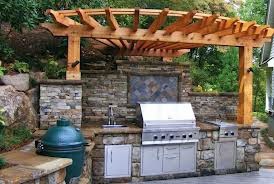 When everyday feels like a vacation with outdoor kitchens, fire places, fire pits, waterfalls, patios, decks, arbors, pergolas, gazebos, sun rooms, pools and landscapes. For a limited time receive a free Big Green Egg (TM) smoker with a deluxe outdoor home package. Who needs a vacation when you can relax in your own outdoor home everyday!